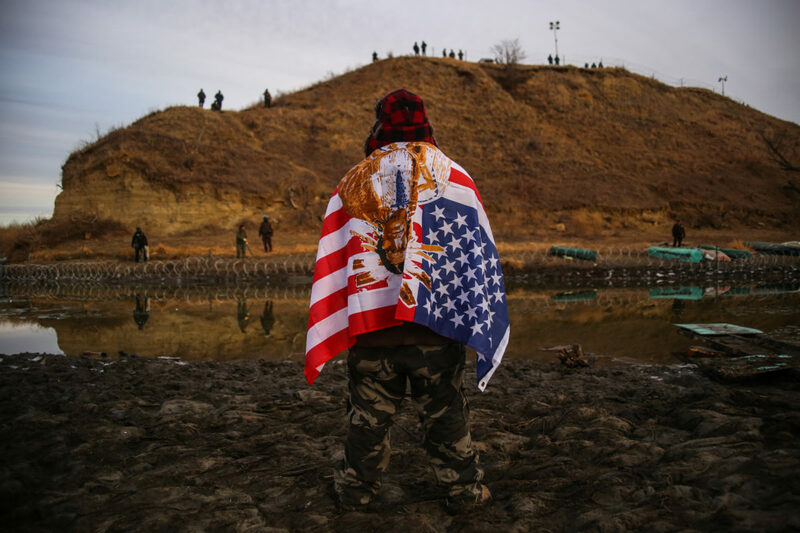 Andrew Waupekenay of the Menominee Indian Tribe of Wisconsin stands as he faces authorities on the other side of the Cantapeta Creek which runs into the Missouri River after barbed wire was placed along the shore near the Oceti Sakowin Camp on Army Corps of Engineers land bordering the Standing Rock Indian Reservation in Cannon Ball, North Dakota in November 2016. A $3.8 billion project by Energy Transfer Partners to construct a 1,172-mile pipeline transporting crude Bakken oil from North Dakota across South Dakota, Iowa and into Illinois has sparked conflict and controversy at a key construction site on US Army Corps land bordering the Standing Rock Indian Reservation. 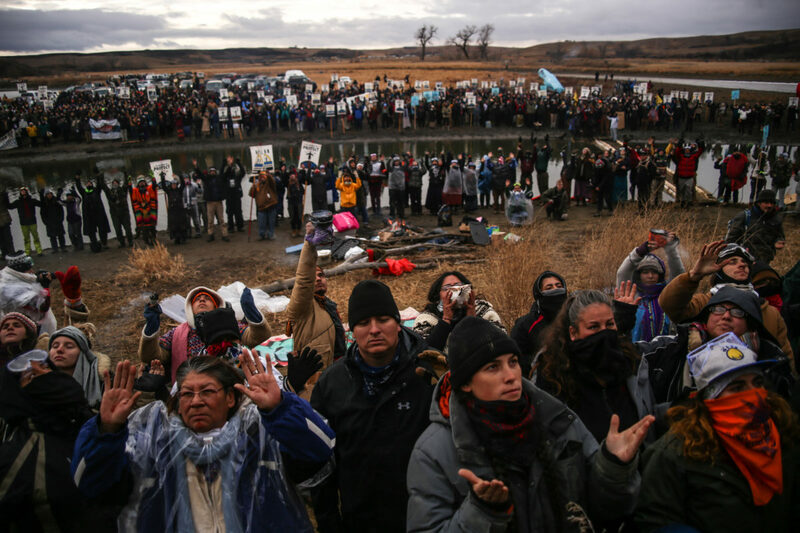 Protestors raise their arms during a prayer at an action defending what they claim to be a sacred site near Turtle Island against construction of the Dakota Access Pipeline in Cannon Ball, North Dakota in November 2016. Protestors have gathered on disputed Army Corps of Engineers land just north of the reservation to protest the construction of the pipeline underneath the Lake Oahe reservoir of the Missouri River for months since early 2016. Protestors say that the pipeline poses the possibility of contamination of the Standing Rock Sioux Tribe's primary water source. Authorities face water protectors as they block them from proceeding further towards the construction site of the Dakota Access Pipeline on Army Corps of Engineers land in Cannon Ball, North Dakota in November 2016. According to the Morton County Sheriffs Department, it has received assistance from 24 counties, 16 cities and 9 other states since August 2016. Unarmed protestors, who have been camping on Army Corps of Engineers land bordering the Standing Rock Indian Reservation, have been hit with pepper spray, rubber bullets and water cannons in freezing temperatures by law enforcement. 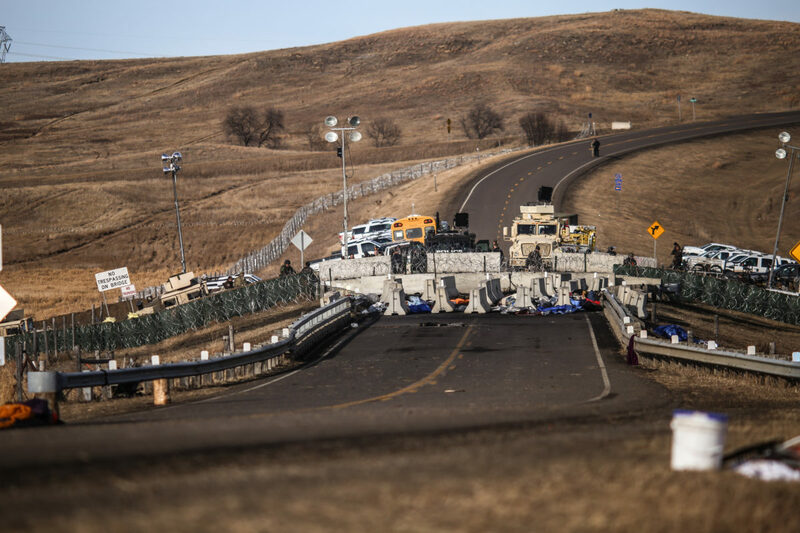 A fortified barricade on the Backwater Bridge on Highway 1806 blocks access to the construction site of the Dakota Access Pipeline near the Oceti Sakowin Camp in Cannon Ball, North Dakota in November 2016. The presence of military-grade equipment such as armored humvees and vehicles, barbed wire and cement barricades at the protest site has sparked controversy. The protest site located on land managed by the Army Corps of Engineers, is considered trespassing and subject to prosecution according to the Army Corps. Chief Arvol Looking Horse speaks to members of the Woodland Cree Tribe at the pipeline protest site located on US Army Corps land in Cannon Ball, North Dakota in January 2017. Land managed by the Army Corps of Engineers where the pipeline has been routed is disputed by protestors to be land of the Standing Rock Sioux Tribe as a result of the 1851 Treaty of Fort Laramie. The treaty established Native American territories and interaction between the tribe and the United States, but was not respected by non-Indians. The treaty council met again to resolve some of these issues in the 1868 Treaty of Fort Laramie establishing specific territorial boundaries and land cessions to the United States. Through the new treaty, the Sioux lost land and would continue to lose land in the following decades. Ron Starr leads members of the Youth Unity Journey for Sacred Waters along Highway 1806 into the Oceti Oyate Camp, formerly the Oceti Sakowin Camp, outside Cannon Ball, North Dakota in January 2017. The Youth Unity Journey for Sacred Waters, led by members of the Woodland Cree First Nations in Saskatchewan, Canada, completed their 46-day-long journey after walking 870 miles from Stanley Mission, Canada to the Oceti Oyate Camp. Hundreds of tribes from around the world have gathered at the site to protest the construction of the pipeline. 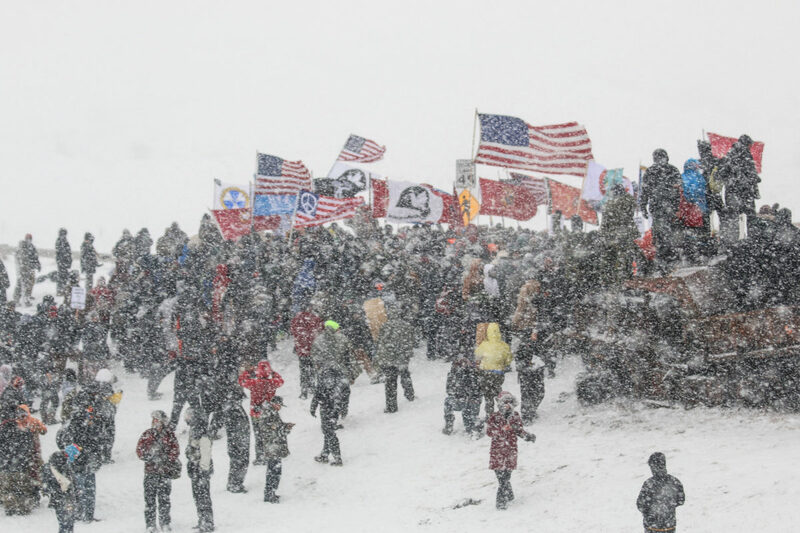 Protestors gather in prayer after marching toward barricades on the Backwater Bridge on Highway 1806 with support from US military veterans on Army Corps of Engineers land bordering the Standing Rock Indian Reservation in Cannon Ball, North Dakota in December 2016. 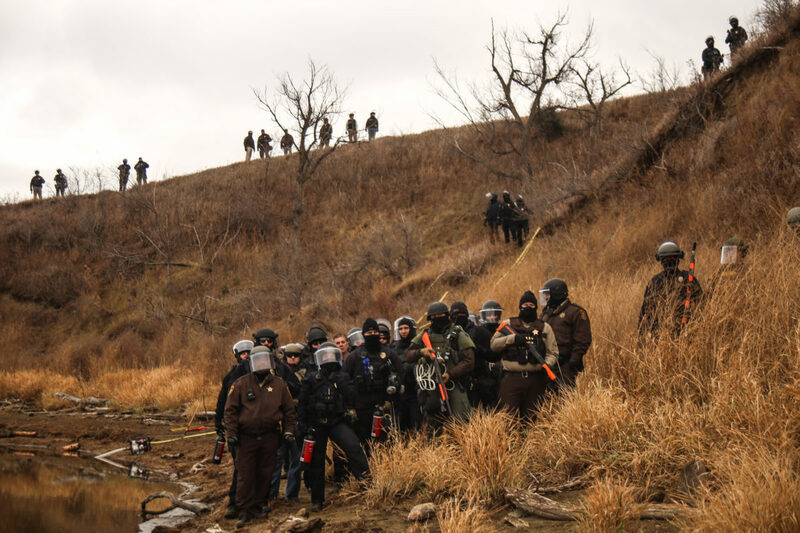 The march took place on the same day that North Dakota Governor Jack Dalrymple's order to evacuate the Oceti Sakowin Camp was to take effect. The Obama Administration also announced that the US Army Corps would not grant Dakota Access LLC the last remaining easement it needed to drill underneath the Missouri River. Toby Joseph sits after being attended by medics for nausea and heavy chest symptoms during the first days of harsh winter at the Rosebud Camp at the Standing Rock Indian Reservation in Cannon Ball, North Dakota in December 2016. Joseph was evacuated out of camp shortly after to a safer area until the blizzard was to calm. Volunteer medics worked around the clock during one of North Dakota's harshest winters in years. Protestors were being treated for hypothermia, trench foot, and asthma symptoms among others. 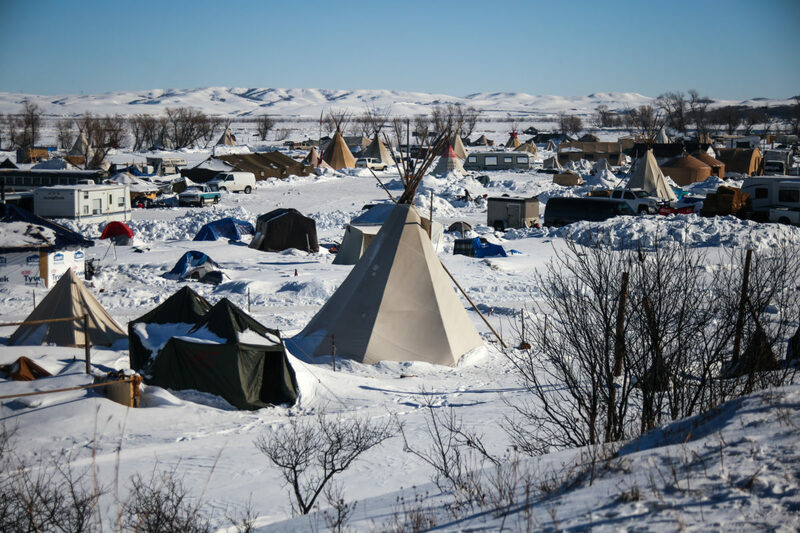 A view of the Oceti Oyate Camp on Army Corps of Engineers land bordering the Standing Rock Indian Reservation in Cannon Ball, North Dakota in January 2017. In January 2017, newly elected US President Donald J. Trump signed an executive order to advance the Keystone XL and Dakota Access pipelines clearing the efforts of the Obama administration. Oil pump jacks are seen along Interstate 94 in the Bakken Formation near Belfield, North Dakota in January 2017. 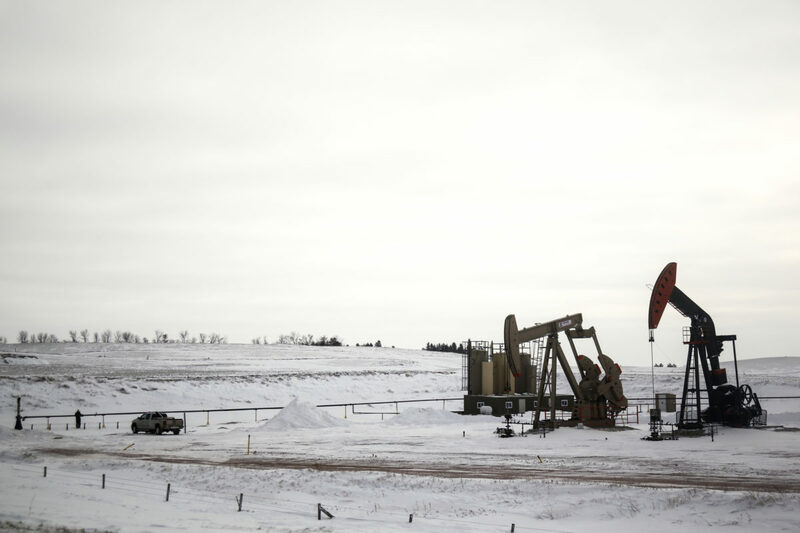 The oil industry in North Dakota supports much of its economic stability and infrastructure. According to a recent study by Grand Forks firm AE2S Nexus, cities in North Dakota’s oil-heavy Bakken Formation are expected to see a growth in population as oil prices recover. The population growth will require an expansion of city infrastructure and services to keep up with demands needed to provide for its residents. 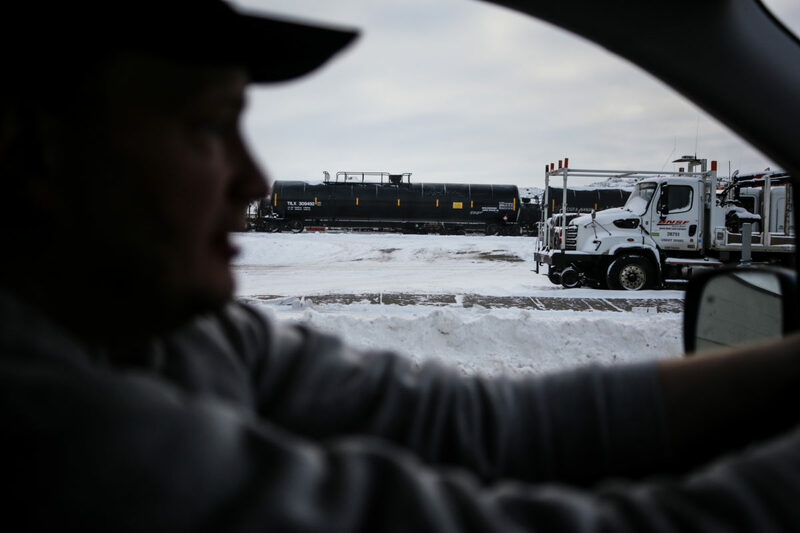 Mike Connelly, a Certified Nursing Assistant (CNA) working in North Dakota in support of the Dakota Access Pipeline, drives past oil tankers being transported by railroad within the Bakken Formation in Glendive, Montana near the North Dakota border in January 2017. Connelly's support for the Dakota Access Pipeline is based on North Dakota's oil-heavy economy and the pipeline's creation of employment to individuals in the oil business sector who are struggling to find opportunities to sustain their families following the 2015 Bakken oil bust. Connelly's experience as a travel CNA adds to his strong belief in the reduction of road accidents and deaths on North Dakota's dangerous roads if the pipeline is constructed, reducing the number of vehicles transporting oil through the state. 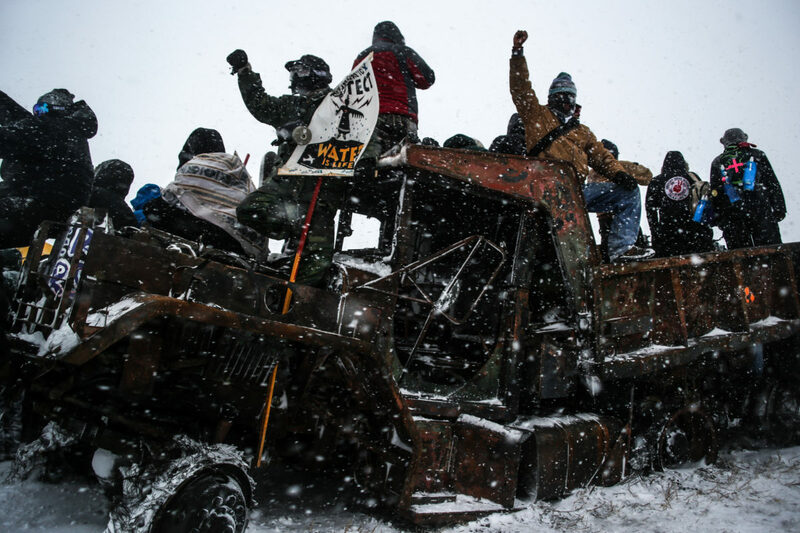 Protestors stand on an abandoned and burned vehicle on Highway 1806 during an action against the Dakota Access Pipeline in Cannon Ball, North Dakota in December 2016. The protest camps located on US Army Corps land are located on a floodplain of the Cannonball and Missouri rivers. Concerns of flooding and resulting environmental damage from structures and waste at the camps have prompted evacuations and evictions ordered by both the Army Corps of Engineers and the Tribal Council. 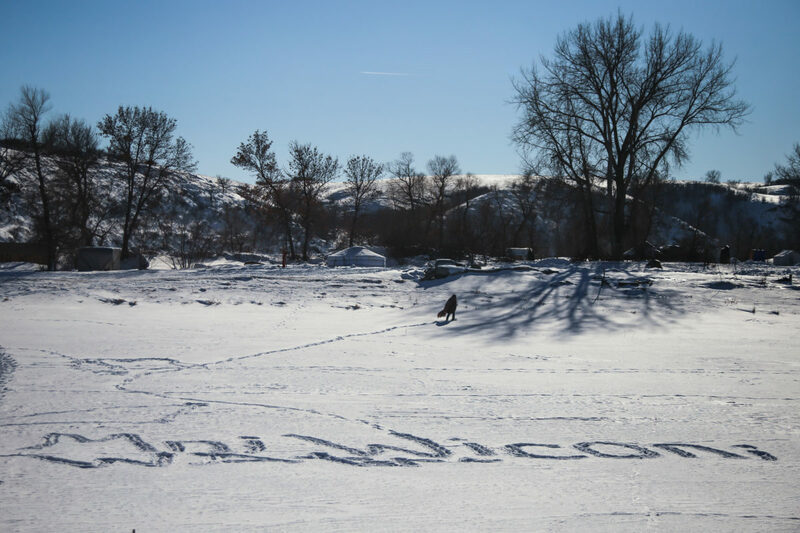 A man walks across the frozen Cannonball River where the phrase, "Mni Wiconi," translating to "Water is life," is engraved in footprint at the Oceti Oyate Camp in Cannon Ball, North Dakota in January 2017. 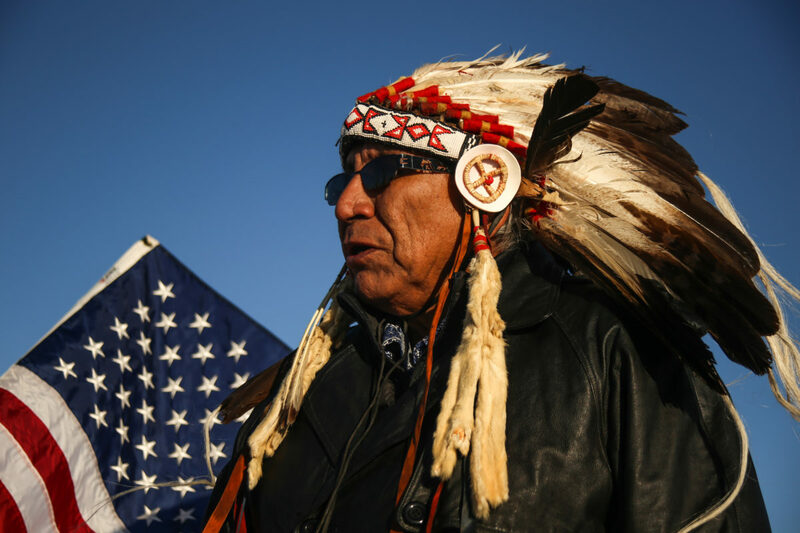 The US Army Corps of Engineers granted the final easement needed to complete the construction of the controversial Dakota Access Pipeline in a court filing on February 7th, 2017. An environmental impact statement that was delaying efforts to grant an easement was also terminated by the Army Corps. On February 7, 2017 the U.S. Army Corps of Engineers granted the controversial Dakota Access oil pipeline an easement to pass beneath Lake Oahe and the Missouri River, north of the Standing Rock Sioux Reservation. Since early 2016, thousands of Native Americans have been fighting to prevent the pipeline’s completion. In the final days of Barack Obama’s presidency the White House put the construction on hold pending further assessments, and for a while the protesters believed they had won. Crowds celebrated with fireworks on the snow covered prairie of North Dakota, but everything changed with the arrival of President Donald Trump. Within days of Trump taking office, an executive memorandum was issued calling for the pipeline to proceed. Within two weeks, the president’s order was followed through, and the Army Corps granted the easement for the pipeline’s construction. For the Sioux people who opposed this venture and the coalition of 200 tribal nations that joined them, this development was a crushing blow. The $3.8 billion project by Energy Transfer Partners to construct a 1,172-mile pipeline transporting crude Bakken oil from North Dakota across South Dakota, Iowa and into Illinois has sparked conflict and controversy at a key construction site on U.S. Army Corps land bordering the Standing Rock Indian Reservation in North Dakota. Native Americans and environmental groups gathered on the disputed Army Corps of Engineers land just north of the reservation to protest the construction of the pipeline underneath the Lake Oahe reservoir of the Missouri River for months since early 2016. Protestors say that the pipeline posed the possibility of contamination of the Standing Rock Sioux Tribe’s primary water source. Land managed by the Army Corps of Engineers where the pipeline has been routed is disputed by protestors to be land of the Standing Rock Sioux Tribe as a result of the 1851 Treaty of Fort Laramie. The treaty established Native American territories and interaction between the tribe and the United States, but it was not respected by non-Indians. The treaty council met again to resolve some of these issues in the 1868 Treaty of Fort Laramie establishing specific territorial boundaries and land cessions to the United States. Through the new treaty, the Sioux lost land and would continue to lose land in the following decades. The oil industry in North Dakota has supported much of the state’s economic success and infrastructure. According to a study by Grand Forks firm AE2S Nexus, cities in North Dakota’s oil-heavy Bakken Formation are expected to see a growth in population as oil prices recover. The population growth would require an expansion of city infrastructure and services to keep up with demands needed to provide for its residents. Energy Transfer Partners claims that the completion of the Dakota Access Pipeline will generate abundant tax revenue and create thousands of employment opportunities, though only a few dozen jobs would remain permanent. The Obama administration denied the final easement to Energy Transfer Partners LLC for construction of the pipeline in December 2016. The U.S. Army Corps also committed to the completion of an environmental impact statement that same month. In January 2017, newly-elected U.S. President Donald J. Trump signed an executive order to advance the Keystone XL and Dakota Access pipelines clearing the efforts of both the previous administration and protestors. The protest camps located on U.S. Army Corps land were situated on a floodplain of the Cannonball and Missouri rivers. Concerns of flooding and resulting environmental damage from structures and waste at the camps prompted evacuations and evictions ordered by both the Army Corps of Engineers and the Tribal Council. 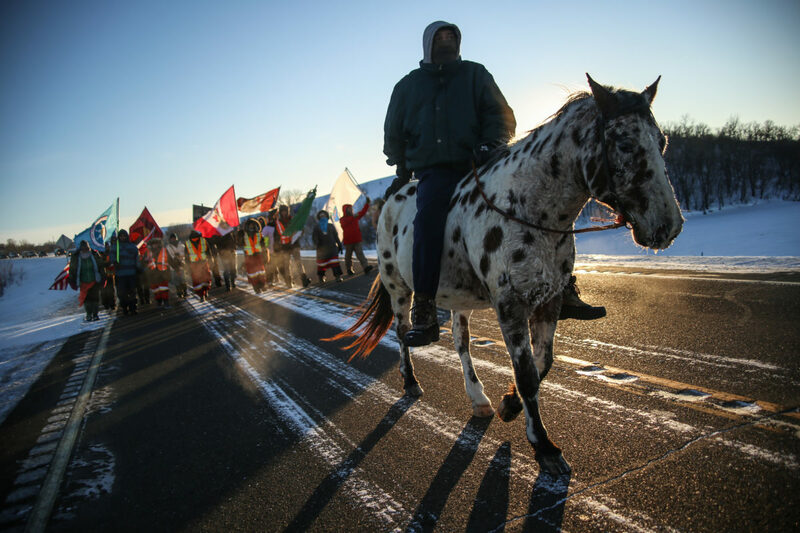 On February 7, 2017, the US Army Corps of Engineers granted a final easement needed to complete the construction of the controversial Dakota Access Pipeline in a court filing. An environmental impact statement that was delaying efforts to grant the easement was also terminated by the Army Corps, despite claims that one would be finished before moving ahead with the pipeline. Images from this story may be licensed for editorial or educational use by publications and educators. Click on the link below to learn more. There are usually more images available from this story than are presented here. Click on the link below to view the entire collection.